If you have a collection of exceptional vintages like a full case of 1947 Château Cheval Blanc or 1869 Château Lafite you may find a wall mountable wine storage "trop de risque". But for all of us who have less preferential taste buds and buy less exceptional vintages such as Trader Joe's Two Buck Chuck, we will find great functional use in the minimalist Winetube designed by Danish designer Kim Almsig for Rosendahl in Denmark. Turn a storage option into an art piece with the simple ingenuity of the Rosendahl Wine Tube, with a natural aluminum finish. The Rosendahl Wine Tube bottle rack features innovative wall mounting that allows your wine collection to become a striking wall display. The design of the wine tube keeps bottles and labels clearly visible, allowing easy selection from your wine collection. The Rosendahl Winetube wine bottle rack is a beautiful wall-mounted wine bottle storage solution. 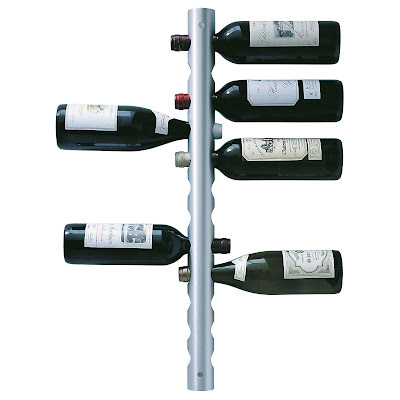 The Rosendahl Winetube wine bottle storage rack is an elegant and stylish organizer for wine. This wall-mounted wine rack frees up space and looks clean and modern too. Rosendahl's Winetube Wine Bottle Rack Storage is a perfect wine rack storage idea for smaller New York City style apartments, or anyone who appreciates a clean modern design aesthetic. Along with the stylish finish of the Winetube wine bottle rack, the bottles and their labels form an integral part of the design piece. This is in contrast to more traditional wine racks where only the necks of the wine bottles are visible. The exposure of the wine bottle's label makes it easy to get an overview of your wine collection. The Winetube is made from a brushed anodized aluminum tube, a series of smart cutouts allow the wine bottles to be suspended perpendicular to the Winetube itself. Simple wall mounting, with fixings provided. A great way to display several bottles of your favorite wine. Holds standard bottles of wine (not large bottles or bottles with special shapes or thicker necks).